I came home from work one afternoon to find my wife away and the PPP outside our building. Hastily, I snapped these pics with my crappy camera phone. 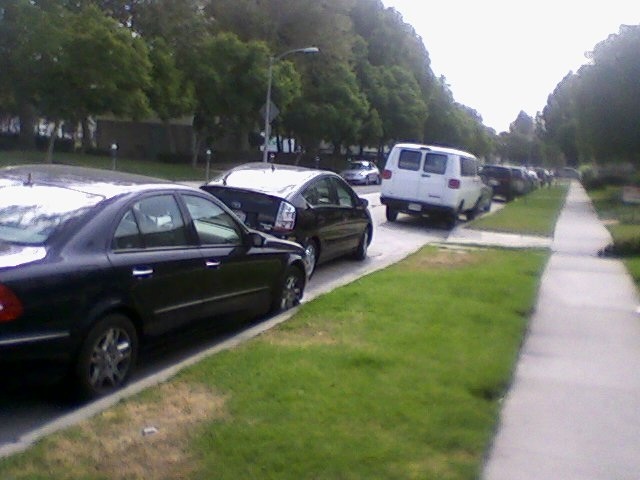 At least the car is actually parallel to the curb here. Three feet away, but parallel nonetheless. Hey, baby steps. Shouldn't Toyota install some sort of alarm or warning ding for situations like this? "Ding! You're parked in the middle of the street." "Is that the same car??" Yes. It's the same car. Every time. 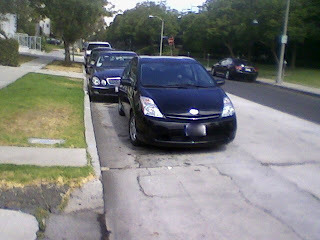 After seeing this Prius parked (horribly) in our neighborhood several times, the decision was made to document this fiasco. Hence, PoorlyParkedPrius.com was born. Is there a PPP in your neighborhood? Have you seen one in the grocery store parking lot? Send your pics of poorly-parked Priuses (or any car, really) to Contact@PoorlyParkedPrius.com. We'll post the best (worst) ones!